Blueberry Benefits For Skin. These cute buttons like berries might taste delicious on the tongue, but did you know their benefits include making your skin glow naturally with beauty and radiance? Need to know how, read further! The first thing that comes to our mind when we think blueberry is that they are delicious, be it on ice cream, in a cake or by themselves. But these little indigo berries are much more than a tasty savory. Blueberries are a powerhouse of antioxidant and anti-inflammatory properties that are vital for skin care. Blueberries and can be eaten raw, cooked with other foods, or dried for use in tea and no matter what form you take blueberries in your diet, they do not lose their essential vitamins and nutrients that are good for your skin. Whether you suffer from acne, broken capillaries or splotchy skin, the nutrients in blueberries will help to keep your skin young and supple. Blueberries are rich in antioxidants that help fight against free radicals that may be harmful to health of the skin. They protect the skin against skin cell damage, thus reducing the signs of aging along with the promotion of skin appearance. Vitamin C has a valuable role in collagen synthesis and found in high levels of various skin layers. Vitamin C helps the skin against ultraviolet (UV) radiation damage. Blueberries are especially rich in anthocyanin, a flavonoid and pigment responsible for red, purple, and blue plant crops. Anthocyanins may be effective against the development and progression of skin cancer. Gallic acid (GA) is virtually found in almost all plants with antioxidant and anti-inflammatory properties. Topical and dietary use may help counteract against damage caused by UV radiation that cause wrinkles, dryness, and thickening of the skin. Resveratrol is an effective anti-aging component. Topical use of resveratrol may block against sun damage and reduce acne. Additionally, oral ingestion of resveratrol may offer skin improvements with enriched elasticity and diminished age spots. Our skin is constantly exposed to dirt, impurities, pollutants, environmental factors, free radicals that damage our skin cells and tissues. Blueberries are a good source of a number of antioxidants, phytochemicals, vitamins, minerals etc. and the presence of these compounds make them very beneficial for healing damaged skin cells and tissues. 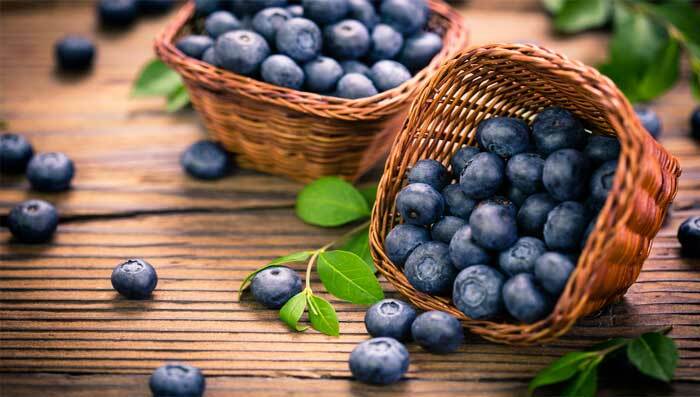 Blueberries are a very good source of number of antioxidants (like Vitamin A, C, E), antioxidant compounds (anthocyanin, Gallic acid), flavonoids, carotenoids and the presence of these compounds makes them suitable for providing relief from wrinkles, fine lines, dark spots, age spots, blemishes and other signs of premature ageing. Consuming blueberries on a regular basis is very effective for healing broken capillaries as it strengthens the blood vessels and capillaries beneath the dermal layer. These can be identified by the splotchy appearance on the skin, which is caused due to the weakening of blood vessels beneath the dermal layer of skin. When these blood vessels get weekend then thin white lines start appearing on the skin surface and are known as broken capillaries (spider veins). The most common factor of acne is clogging of our skin pores by dirt, impurities, excess oil and other pollutants, which gives rise to pimples (acne) and other skin problem. Blueberries are a good source of vitamins, minerals and antioxidants that makes them very beneficial for treating acne. The antioxidants fight with the free radicals of our body and stabilizes them thus prevents our skin from oxidative damage. Vitamin C and A present in blueberries help in controlling excess oil and removing toxins from our body and skin that clog our skin pores. Being rich in vitamins and minerals, blueberries act as a natural skin toner. It is very effective to tone our skin properly which provides a lot of benefits like maintains pH balance, removal of toxins from our skin, shrinking and tightening of skin pores, providing nourishment and hydration to our skin, reducing the acne. Blueberries are beneficial not only for improving our skin tone but also for removing dead and dry cells from skin. This wonderful fruit can be used as an excellent natural scrub. Blueberries not only helps in removing dark circles but also helps in preventing our eyes from oxidative damage thus reducing the risk of macular degeneration and keep our eyes healthy. Blueberries are an excellent source of a number of nutrients like vitamins, minerals, antioxidants, flavonoids, phytochemicals etc. and this makes it very beneficial for providing proper nourishment to our skin. Consuming blueberries on regular basis is good for skin nourishment but topical application of blueberries can also be used for keeping our skin properly nourished. Blueberry extract has been used in beauty related treatments and cures for centuries now. Even today, many skin care treatments now use blends of blueberry extracts along with other herbs to help revitalize the skin and hasten healing. These treatments have also shown marked ability at reducing scarring in wound and burn treatment. Along with heart, digestive, and immune health, blueberry extract may have a critical care role in skin health and care. Blueberry extract is a natural substance sold in supplement form. Said to offer a range of health benefits, blueberry extract is often touted as a rich source of antioxidants. These antioxidants include anthocyanin, a class of compounds purported to reduce inflammation and protect the skin from cellular damage.